Egyptian cotton refers to a dense woven cotton cloth, a number of high strands of braided form. The number of threads refers to the number of horizontal and vertical threads to create one square inch of fabric. Most people think percale refers to the content of the fabric, however, it really refers to the web's fabric. Percale cotton sheets usually have a yarn density of at least 150 and this type of fabric can be easily washed at home. Egyptian cotton if it is known to wash properly and last for many years. 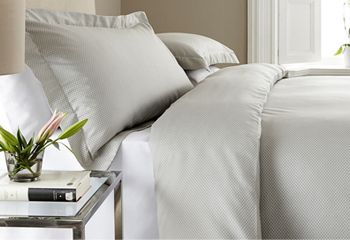 Cotton satin is usually made from braided yarn, but uses a finer yarn than cotton percale. It is woven differently and generally has a percale upper yarn density as finer yarns starting at 600 yarns. Satin fabrics have a tendency to lose their luster after the first wash, due to the type of construction of a satin fabric. However, ironing satin cotton sheets after immediately washing the soft fibers and restoring the fabric's luster and silkiness. Egyptian cotton that has undergone a mercerization process is the most durable type of Egyptian cotton. Mercerization is a process whereby a cotton or fabric thread passes through a controlled thermal environment (called burned) and then treated with a solution of caustic soda (sodium hydroxide). This process burns any fluff outside the cotton thread and ultimately results in cotton, which has superior shine and affinity to the dye. Thereafter, repeated washing is less likely to lead to discoloration, in color or shine, of mercerized Egyptian cotton household linen. It is little known, but a very important fact, is that Egyptian cotton is the best type of cotton cloth for allergy people .. Always wash Egyptian cotton percale fabrics, in a separate load of regular clothing such as zippers, hooks and buttons have a tendency to damage cotton sheets. Be careful to always use a gentle wash cycle with a cold temperature setting and a mild detergent. Detergent quality has a balanced pH. Chlorine bleach is not recommended because it could damage the fibers of our quality fabrics over time. If necessary, bleach without chlorine can be used with white and ivory from our Egyptian cotton clothing. Remove Egyptian cotton clothing if delayed after washing to reduce wrinkles. Shake clothes before putting them in the dryer as it reduces wrinkles as well. The temperature of the dryer should be a warm temperature, remove the laundry while it is still a bit damp and hang to finish the drying. After making the bed, alise manually minimize wrinkles. Ironing is a matter of choice, but not usually necessary for cotton sheets. However, some people prefer ironing their cotton bedding for a more distinct appearance.